It is straightforward to do the orchestration leaning on relational databases as a data layer. However, it is more difficult to do the same when a distributed SQL database or other kind of distributed storage is used instead. * Cluster Assembling - database nodes auto-discovery in Kubernetes. * Database Resilience - automated horizontal scalability. * Database Availability - what’s the role of Kubernetes and the database. * Utilizing both RAM and disk - set up Apache Ignite in a way to get in-memory performance with the durability of disk. 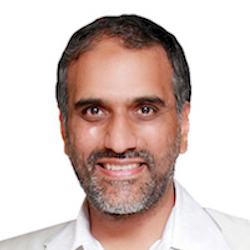 Akmal Chaudhri is a Technology Evangelist at GridGain. His role is to help build the global Apache Ignite community and raise awareness through presentations and technical writing. He has over 25 years experience in IT and has previously held roles as a developer, consultant, product strategist and technical trainer. He has worked for several blue-chip companies such as Reuters and IBM, and also the Big Data startups Hortonworks (Hadoop) and DataStax (Cassandra NoSQL Database). He has regularly presented at many international conferences and served on the program committees for a number of major conferences and workshops. He has published and presented widely and edited or co-edited 10 books. He holds a BSc (1st Class Hons.) in Computing and Information Systems, MSc in Business Systems Analysis and Design and a PhD in Computer Science. He is a Member of the British Computer Society (MBCS) and a Chartered IT Professional (CITP).